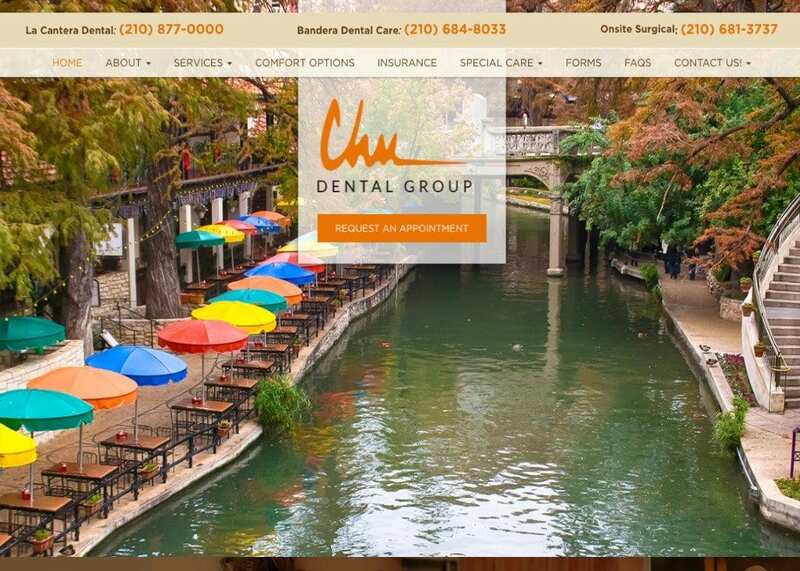 Chu Dental is located in San Antonio, TX and is run by a team that knows how to bring comfort and peace of mind to their patients. With a goal of personalized care and comfortable dental experience, they came to Optimized360 looking for a website design that properly represents their philosophy. We worked with them to bring this incredible website together and to be their web presence to their customers. The result was something they’re proud of, and we’re eager to share with you. This website’s design immediately brings a smile to your face, pun not intended. From the bright colors to beautiful autumn tones, everything about this site is gorgeous. The last thing on the mind of visitors to this site is the perceived pain and discomfort of a visit to the dentist. Instead, they have visions of pleasant fall days and relaxation. The information is presented in a convenient and accessible way, and every element of the page provokes a warm and friendly reaction. An excellent site for an industry that many people experience some anxiety about. Warm, inviting oranges and earth tones run through this website, colors that are psychologically associated with enthusiasm and warmth. Beige is known to evoke ideas of dependability and relaxation, and we feel these aspects come together in a way that is both aesthetically pleasing and achieves its goal effortlessly. The rich browns used to showcase the various services they provide combined with the subtle autumn tones in the images themselves inviting viewers to investigate and find out what the office can do for them. This website is laid out in a way that is as accessible and inviting as the Chu Dental Group itself. Their phone numbers are listed at the top along with an attractive presentation of links to information about the treatments offered by their clinic. Everything in it engenders the sense of ease and comfort the client was looking for, with a smooth flow of design and color that is rare even in the most well-designed websites. It also does an excellent job of presenting the unique approach the facility takes, introducing their philosophy, the doctor, and Macie the on staff therapy dog, capping it all off with a set of testimonies from their clients. The marketing of this website is heavily focused on patients who are looking for a dentist that is heavily focused on their comfort before and during procedures. The website is accessible and easy to navigate, providing multiple points of access to making an appointment. The top of the website immediately presents the phone numbers for the clinics as well as a quick drop-down contact us button. This site reflects an inviting facility with warm, friendly staff, every aspect coming together to reinforce this first impression. From the autumnal colors to the order that information is presented it gives a feeling of being welcomed. It’s subtle psychology, but even the choice of faces for the service links are aimed at reinforcing the idea that they aren’t just glad you’re there, they’re genuinely happy to see you.